At Hotel Ganges Rivera, quality, comfort, attention to a client's specific requirements and personal service, are the prime considerations. Looking at the business needs of all entrepreneurs and large corporate, we have established facilities that cater to the requirements of today's tension prone fast moving businessman. 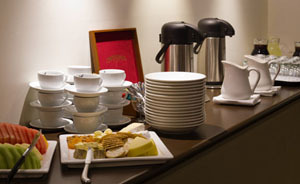 The hotel offers comprehensive Conference and Banquet services. The package includes a choice of conference from 50 to 100 persons with state of the art facilities like communication assistance, email, fax and internet. Audio Visual equipment for presentations is also available on demand. A variety of other equipment may be arranged upon request. Individually designed 24 hour and Day Delegate packages are available. Please contact us for more information or to request our comprehensive conference pack.